Assist Section Head to establish programmes and plans of action to effectively support the operations of the Electrical & Electronic testing section. Assist Section Head in the Development program for section activities as planned in the yearly Business Plan. Assist Section Head in formulate and implement policies and procedures to fulfil the requirements of OSHE. Assist in the development of new projects and programs, which involve identify, plan, research, analyse and benchmark the potential of new businesses. 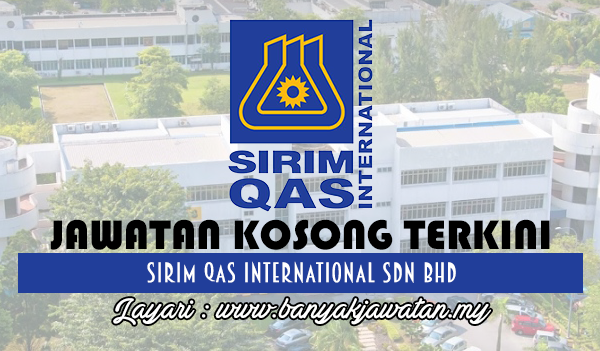 Responsible to ensure the delivery of services complies & meet SIRIM QAS International Sdn. Bhd. standard of performance. Possess a minimum Degree in Electrical Engineering or equivalent, with 3 years' experience in the related field. Good oral and written communication skills in both English and Bahasa Malaysia. Prepare to work under pressure and ensure deliverable. Self-motivated, with excellent interpersonal skills. 0 Response to "Jawatan Kosong di SIRIM QAS International Sdn Bhd - 10 Ogos 2018"